An oldie but a goodie! I make a huge pot of this and get enough for Spag Bol and a Lasagna. The sauce is packed with secret veggies so it is perfect for fussy eaters! If you are doing both, double up on quantities. Start by browning the mince in a large heavy pot. Keep the heat quite high, and break it up so it is nice and fine with a wooden spoon. I like to minimise the fat content in my cooking, so as I am going along, I pour a lot of the fat out of the mince, not all of it! Some may argue this compromises the taste, however I beg to differ. Remove mince from the pan. Add a dash of olive oil and heat, throw in the onions. Soften for 5-7 mins. Add the carrot, celery and garlic and continue to soften for another 3-4 mins. Return the beef to the pot. Add the oregano and mix through. Add the tomato purée and mix through. Add the wine and cook for two mins. Add the tins of tomatoes and the beef stock, bit by bit. Don’t add it all if it is looking too sloppy. Cover and turn down the heat to a gentle simmer for 30-40 mins. Serve with your pasta of choice and enjoy! It’s Friday night, I have one too many eggs, and some other random ingredients rocking around my fridge! Add a cheat ingredient in the form of Ready to Roll Shortcrust (normally make my own, so this kills me a little 😂) and boom, I have a rather lush, tasty tart! Dust your work surface and the surface of the pastry with flour to ensure it does not stick. Roll the pastry out until it is really thin and fits the quiche dish. Gently fit it into the dish, line the dish with grease proof paper and fill with baking beans. Put into the oven for 10 mins, then remove the beans and put it back into the oven for 7-10 mins to crisp up. Take out of the oven to cool. Meanwhile, add a dash of oil to the pan and cook the onions gently for around 10 mins. Add the courgette and cook for a further 5. In a large bowl, add the seven eggs and the milk and whisk up really well. Season the eggs with salt and pepper. Add the onion and courgette mixture to the pastry case. Now pour in the egg mixture. Turn the oven down to 180c and cook for 35-40 mins until well set and nicely browned. Serve with a nice green salad. Having spent a month in Spain, I ate a few lush paella. 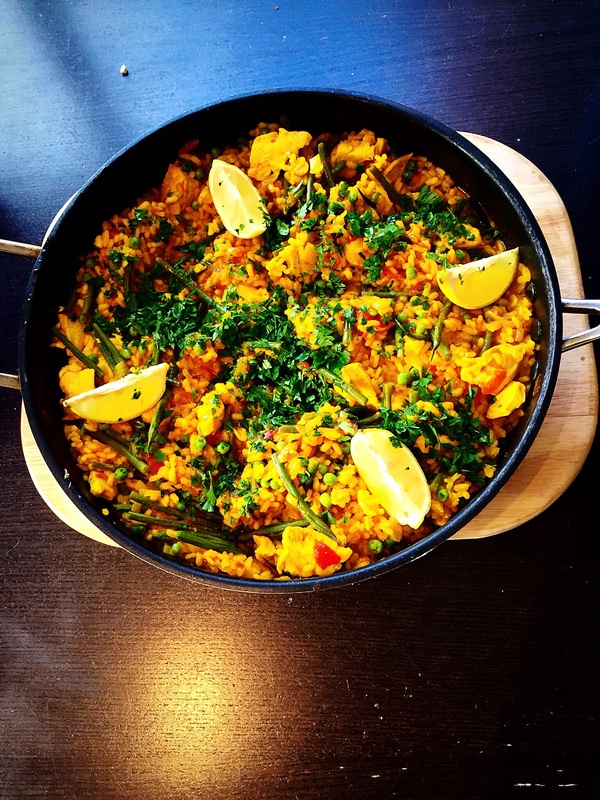 The key to paella is the crust or ‘Socarrat’ from the Spanish word ‘Socarrar’, meaning to toast lightly. Anyone familiar with cooking a risotto will be tempted to stir…resist!! I admit that I do give the veggies a quick mix in, after that I leave it to Socarrar! If like me, you don’t have a proper paella pan, just use a pan with a nice heavy base. Heat the oil (3-4 tbsp) and then add the onion for 5-8 mins to soften. Add the Chicken and cook until it has a golden colour. Add the rice and stir until well covered in the oil. Add all of the seasoning and the stock and stir. Turn the heat down and. Cover with tinfoil for 15 mins. Add the veggies, give them a cheeky stir. Cover with the foil again and leave on the low heat for around another 15 mins until all the stock is absorbed. Turn off the heat and leave covered for another 10 mins. Sprinkle with parsley and arrange lemon pieces. Serve with a nice glass of Rosé! I have stuck to chicken as my kids don’t like prawns, feel free so add some huge big raw prawns around 10 mins before the end. 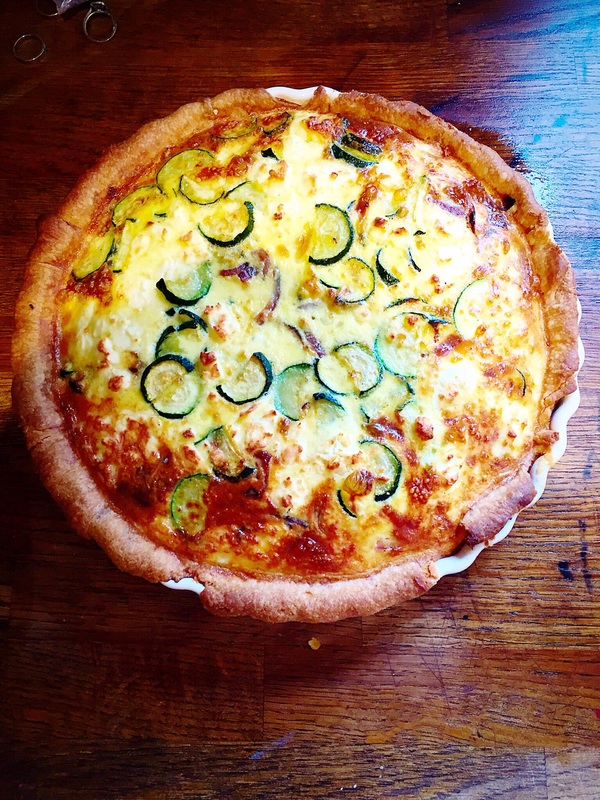 Super easy, super healthy and super tasty…who ever thought it was possible! Add some oil to a large saucepan. When hot add to it the carrots, celery, onion and leeks. Fry gently for 5-6 mins. 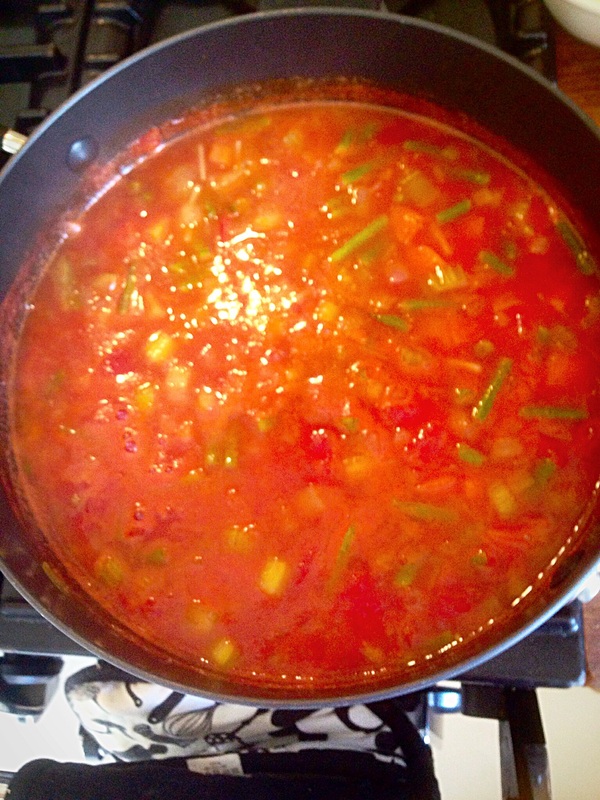 Chuck in the green beans and the Borlotti beans, tomato purée, pasta and stock and stir well. Season with Maldon sea salt and black pepper. Cook on a medium heat for around 10 mins or until the vegetables and pasta are just tender. Serve with some lovely crusty bread! Boom…delish! 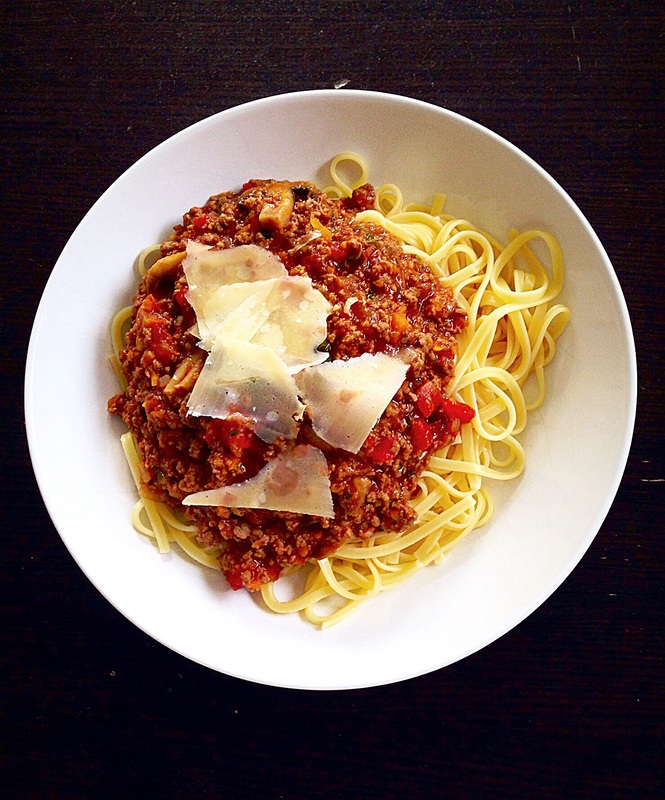 This is super cheap, super easy and super tasty…no excuses, anyone could rock this one up! Place all of the marinade ingredients in a bowl and combine well. Add the chicken to the bowl and ensure it is covered well in the marinade. Leave overnight in the marinade, if you are short of time leave for at least an hour. 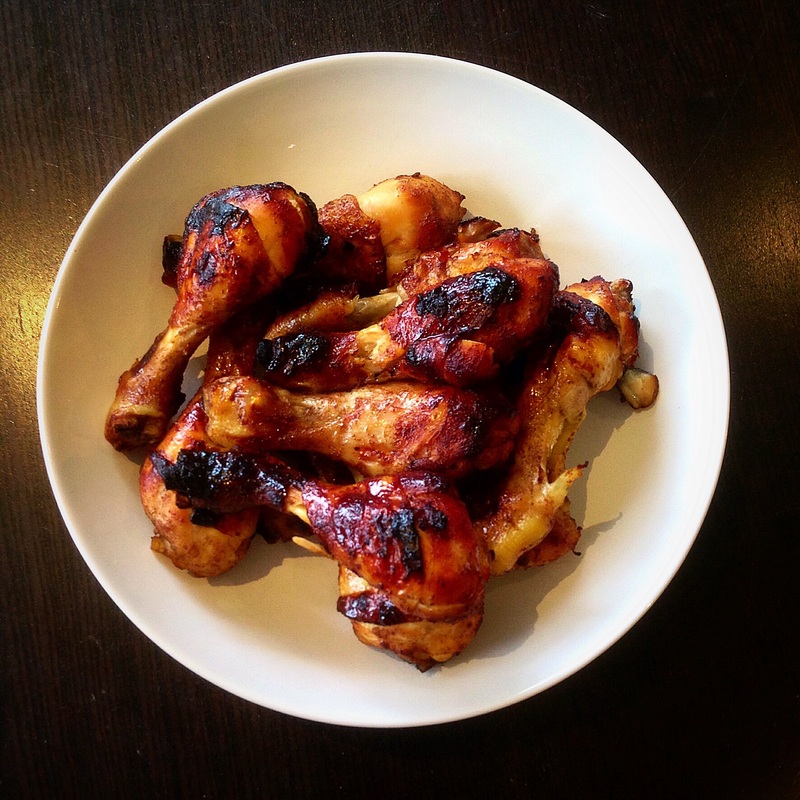 Place the drumsticks on a roasting tray and roast for 30 mins or until cooked and the skin nice and crispy. Serve with rice and some steamed broccoli or Pak choi.